WALLACE RIVER, NS, Dec. 1, 2015 /CNW/ - Ian Murray, of Wallace River, Nova Scotia has earned First Prize in the 2015 American Wildlife Federation Photo Contest in the BABY ANIMALS category. 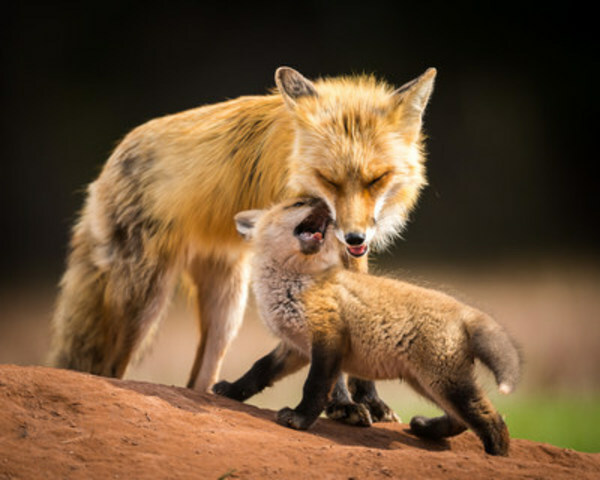 His winning image – "MOMMA AND BABY RED FOX" – Photo # 1, will appear in the December 2015/January 2016 issue of National Wildlife magazine and be promoted on National Wildlife Federation's website, blogs, Facebook page and other publishing mediums. Murray's First Place photograph, as well as the other winning shots from the other categories in the competition can be seen on National Wildlife's Photo Zone page (www.nwf.org/photozone). It was chosen from 6,765 entries from around the world. "What a thrill and honour to receive such recognition from the American National Wildlife Federation judges," said Murray, who is no stranger to capturing stunning wildlife photographs in his travels throughout his home province. This win marks the second time his images have scored First Place in international competitions. Last year, Murray won top spot in the 2014 American Bald Eagle Photo Contest for his image – "MASTER FISHERMAN" – Photo # 2. The competition, sponsored by Potomac River Bald Eagles, attracted entries from across North America. Murray's images of the people, places and wildlife of Nova Scotia have also appeared in publications promoting Nova Scotia and the Maritimes. Ian Murray started Wallace River Photography in 2009. Specializing in Wildlife photography, he is based in a rural Nova Scotia near the picturesque community of Wallace.